Oct. 24 — More than 5,300 subsidiaries disappeared from the Securities and Exchange Commission filings of three major U.S. banks—Bank of America Corp., Citigroup Inc., and Wells Fargo & Co.—in the last eight years, according to an analysis by Bloomberg BNA. Most of the subsidiaries still exist, but loose regulation and enforcement by the SEC allowed them to disappear from public view. Representatives of the banks told Bloomberg BNA that the change was based on materiality of the subsidiaries, although academics and tax justice advocates highlighted the potential for undisclosed subsidiaries to be used for multimillion-dollar tax avoidance schemes. According to the business-transparency website OpenCorporates, few of the subsidiaries were labeled “delisted,” “dissolved,” “inactive” or something similar, and the number of subsidiaries listed by those big banks with the Federal Reserve barely changed even as the number listed with the SEC plunged. 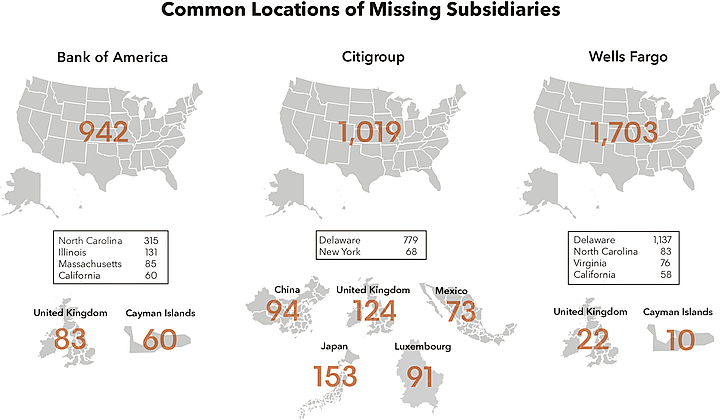 For Citigroup, more than 2,000 subsidiaries vanished between 2008 and 2009; for BofA, 1,200 went missing between 2013 and 2014; and 1,300 went hidden for Wells Fargo between 2014 and 2015. Not only did the number of subsidiaries listed with the Fed stay nearly the same for these years, the number for BofA even increased. Other major banks, including Goldman Sachs Group Inc., JPMorgan Chase & Co. and Morgan Stanley have never listed the majority of the 2,000 to 4,000 subsidiaries that each owns. Delaware is home to by far the largest portion of these missing subsidiaries: 37 percent. A significant number of others are located in North Carolina and California; foreign countries including the U.K., Japan and China; and cities such as Chicago and New York. Some were in tax haven jurisdictions such as the Cayman Islands, Luxembourg, the British Virgin Islands, Channel Islands, Bahamas and Bermuda, but almost 70 percent of the total were in the U.S. Although thousands of subsidiaries ceased to be disclosed in SEC filings, the amount of income reported from their total subsidiaries, according to Fed numbers, changed little for Wells Fargo and BofA during the same time (numbers were not available for Citigroup). Numbers from the Fed show investments in unconsolidated subsidiaries at more than $5 billion for Wells Fargo, $7.3 billion for BofA, and $8.4 billion for Citigroup at the end of 2015. A 2013 paper from researchers at Baylor University and Washington State University found that Google Inc. and Oracle Corp. suddenly ceased disclosing a significant number of their subsidiaries in a similar fashion. In 2010, Google's list of subsidiaries went from 118 to two, and Oracle's went from 428 to six. One hundred of Oracle’s subsidiaries and 25 of Google’s were located in tax haven jurisdictions. The researchers showed that both companies should have disclosed the subsidiaries, according to SEC regulations on subsidiary income, individually or in aggregate, because the amount of income from the subsidiaries exceeded a reporting threshold. But the companies may have chosen not to disclose, for tax purposes or otherwise, and simply pay the SEC penalty for non-disclosure, which is $100 a day. A 2016 report by Citizens’ for Tax Justice on abuse of tax havens indicated it is common for companies not to disclose subsidiaries. The report pointed to weak disclosure rules that have allowed non-disclosure of at least 45,000 subsidiaries, many in tax havens, of companies such as Wal-Mart Stores Inc., Google, BofA, Citigroup, Morgan Stanley and others. Jerry Dubrowski, a spokesman for BofA, attributed the change to “resolution planning and simplification” following the mortgage crisis. “Previously, the company simply disclosed all of their subsidiaries by default, but according to SEC regulations, only material subsidiaries need to be disclosed and many [Bank of America] ones weren’t,” he told Bloomberg BNA. Peter Gilchrest, communications manager for Wells Fargo, explained the lack of reported subsidiaries was a result of their irrelevance since they would not constitute a “significant subsidiary” when aggregated together, based on SEC regulations. Citigroup pointed to the same SEC regulation in their 2009 10-K as an explanation for the sharp drop in subsidiaries. A representative from the SEC declined a request for comment. “Traditionally, most companies simply reported all of their subsidiaries, since it meant they didn’t have to make any materiality determinations,” he told Bloomberg BNA, but that as Congress began asking questions about tax avoidance in recent years, companies began disclosing less. A 2006 report on tax havens from the U.S. Senate Permanent Subcommittee on Investigations spawned numerous investigations into tax haven abuse. Demere added that there were no significant changes to SEC rules that would affect Exhibit 21 subsidiary disclosures in the same time period. Tax advocacy groups that push for more stringent tax enforcement pointed to the SEC’s rules and enforcement as a loophole for nondisclosure. Matt Gardner, executive director with the Institute on Taxation and Economic Policy, told Bloomberg BNA that rules governing materiality “are neither stringent nor precise,” and that banks are realizing they don’t have to disclose them if they don’t want to. Ron Eckstein, communication director with Americans for Tax Fairness, emphasized the importance of disclosure in SEC forms. “It’s extremely hard to find and connect the dots of corporate money without disclosure; it’s like finding a needle in a haystack,” he told Bloomberg BNA. Besides tax avoidance, Eckstein pointed to investor risks with unknown subsidiaries. “There's a requirement for investors to know what’s happening with their money and whether it’s going to a country that’s unstable, whether there are hidden pockets of money, and whether there are liabilities,” Eckstein said. Similarly, Gardner highlighted the risk to shareholders and the potential tax bill that might arrive at these banks’ doorsteps if regulations were to change. Gascoigne criticized the SEC’s outreach, saying that the agency put out a rule eight days after requesting comments, not giving much time for anybody to respond. “It’s very telling. They didn’t pretend to read the comments, didn't take the feedback into account, and as a result the rule doesn’t change anything related to disclosure,” even though the vast majority of the 26,000 comments requested more disclosure, he told Bloomberg BNA.